So I have a GAK which as you know is an example of Vics 111mm line of knives. Love this thing and its super tough pry tool cap lifter. Not having a pocket clip I am at a loss for how to carry it. Hoping that when my P2 Skinth gets here my issue will be sorted and for now I keep it in a Gerber MP 600 sheath on my body armor. My question to you is how did you solve this question and carry your fatty SAK? My OHT (virtually identical to a GAK) fits perfectly in a Maxpedition Single Sheath. Paracord loop through the keyring, with carabiner or S-biner. Clip to belt or belt loop and dangle into pocket. The worst that has ever happened was the knife got pulled out of my pocket when a branch snagged the paracord. All my larger SAK's get dangled into pockets rather than sitting at the bottom. I am a fan of the Maxpedition gear, thanks for finding this. This is made for the Vic 111.It uses a snap that has the Vic cross logo.It's made of heavy duty cordura. I pocket carried my Outrider. It was a tad large for it, but as long as is sat vertically in my pocket, it was comfortable and not too obvious. Of course, at the time (as now) it was jeans, jeans, jeans, all the time. Edit: It is telling, however, that once I started substitute teaching more regularly, I switched back to a 91 or 85 mm. 30 Day Coghlan's Army Knife Challenge 2013! | 30 Day Coghlan's Campers Tool Challenge 2013! 30 Day Huntsman Challenge 2013! | Cancelled Rebar Challenge 2014! Thats a nice pouch, thanks. You're welcome and there's no shipping fees! Have all 3 Vic nylon sheaths and all work fine. I am very confused by this. I like the MOLLE seath. 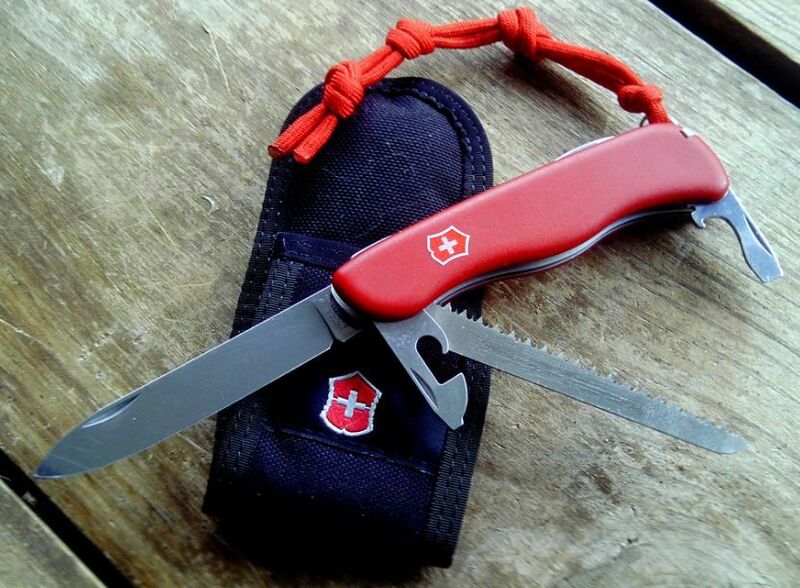 It is soft and adaptable for many tools (111mm, Spirit and most tools around 4"), it has a nice shape and it goes great with military/hunting outfits. 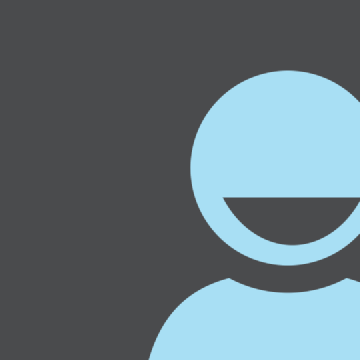 Zombie Apprentice Posts: 16,677 I'm not a pessimist, I'm an experienced optimist! I have come to the conclusion that for me the 111mm ones are best carried in a vest / jacket pocket. Alternatively a sheath or a suspension clip could do it but I'm not too keen on using those. If you want to attach it to your combat vest then the MOLLE version is a great option. Also looks the coolest IMO. But the Vic MOLLE sheath isn't a 1000 denier sheath like you're probably used to....it's more, "refined" is the word I guess. Well built but not not overbuilt if you know what I mean. 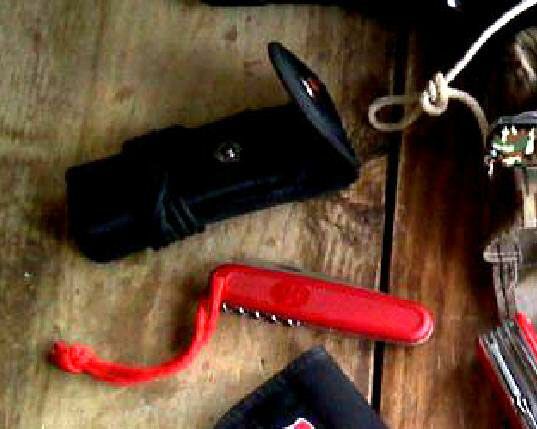 I might be able to contribute here.I keep my Outrider in my right cargo pocket of my combat trousers.Attached by the keyring is a foot of 550 cord which passes through a cheapy fire steel that I carefully drilled a hole through.I don't really use this knife it is my backup option when I don't have my molle belt on that has my esee3 and LM BO Surge on.Its also kind of a last ditch survival option if I lose everything but my pants! I loop the paracord through the buttonhole so it doesn't fall out. That Molle sheath is very cool, going to get one for sure. How is the fit? My Gerber sheath is to big for the GAK and it bounces around some in it. When I said I was confused what I mean is I do not understand why you have three sheaths that do not fit a Trail Guide. Seems like a waste of money to me. It fits fine but not skin tight. That other sheath in the MOLLE pic has one of my OHT's in it. They are buried in one of my bags so no new pix. Oh, and wasting money is my hobby....just ask my Ex. Yeah do not need skin tight just more better then the giant Gerber sheath I am using now. I might have one on the way already as part of a deal I made for the CT 41 with Thomas. Bit of good luck there if it is the same kind. This, especially when wearing jeans or Jean style trousers. I sub the S-biner for a simple knot that tucks under my belt. Perfect for civilian use. A more secure clip is used where required. It´s the same material, but another sheath. I hope you will like it. I have a Workchamp. It fits perfectly in a Skinth M Shield with either a AAA flashlight or mini Bic. You bucking for a place on the list guy? I was wondering about the knot someone had said they use instead of a carabiner. Great pics and it is just a matter of time before I get me a Skinth sheath. Waiting to see how nice the P2 I have on the way is first. Want to put it on my Army combat gear in an attempt to fancy things up around here. 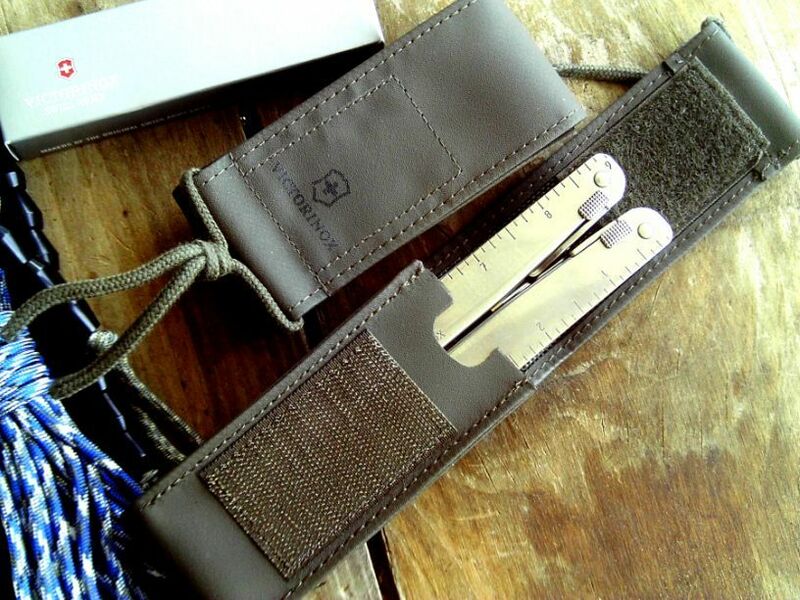 I bought a pocket clip from Swiss Banco that fits my soldier perfectly. Very easy to Cary now. I saw that while I was doing some 111 research. Got a couple of questions. Could you post a pic of it in your pocket? Looks like it might ride a little high. Also is there a gap between the scale and the knife now with the clip piece behind the scale now? There is just the smallest of gaps be tween the scale and the liner. The steel insert fits pretty well. I think the gap is from me tightening the screws to much and slightly warping the scale. Does ride kinda high though.